Kangaroo Paw Walk is a 2.4km, grade 2 Return hike located in Racecourse Flora Reserve Western Australia. The hike should take approximately 0.75hrs to complete. 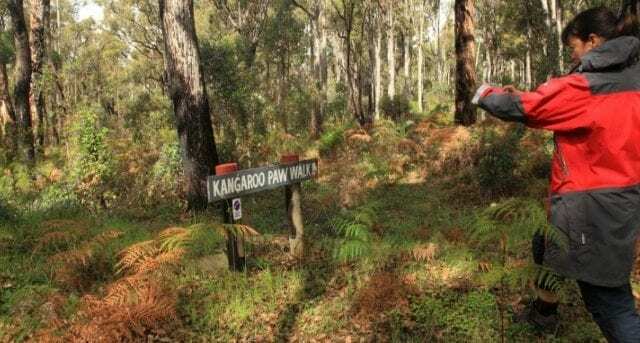 The Kangaroo Paw Walk is one of the walks at theRacecourse Flora Reserve, situated between the towns of Mullalyup and Balingup, approximately 2.5 kilometers northwest of Balingup. In 1999 the Balingup community identified bushland considered worthy of protection in three adjoining reserves. These reserves contained abundant flora and areas of conservation value. The reserves included the site of the old racetrack and gymkhana ground. The three reserves are now amalgamated and vested with the Shire of Donnyrook-Balingup as a reserve for the purpose of conservation and recreation. The reserve (approx 108 ha) is an island of bushland surrounded by cleared land. It straddles the Mullalyup Brook/Balingup divide and is underlaid by the Kirup Conglomerate, a geological formation uncommon in the area. While some areas within the reserve are degraded from previous activities, many areas are in very good condition. The Balingup Friends of the Forest, with the help of supporters and the Shire of Donnybrook-Balingup, continue to both protect the high conservation value bush and restore degraded areas. In Spring, the reserve becomes a blaze of colour, with an amazing abundance and diversity of wildflowers. Each week of spring sees change until early December. Banksia grandis (Bull Banksia) is one of the last plants to flower, with its wonderful bright yellow candles, which then form into the well-known Banksia see or nut. A copy of the herbarium for the reserve is held by the Balingup Friends of the Forest. The herbarium contains photocopies of the plants identified on the reserve, along with their botanical names. Start Point: South West Highway, Balingup which is 240km (2hrs 40mins) south of Perth. End Point: South West Highway, Balingup which is 240km (2hrs 40mins) south of Perth.